If you live in Kolkata, it might be a good day to stay at home. 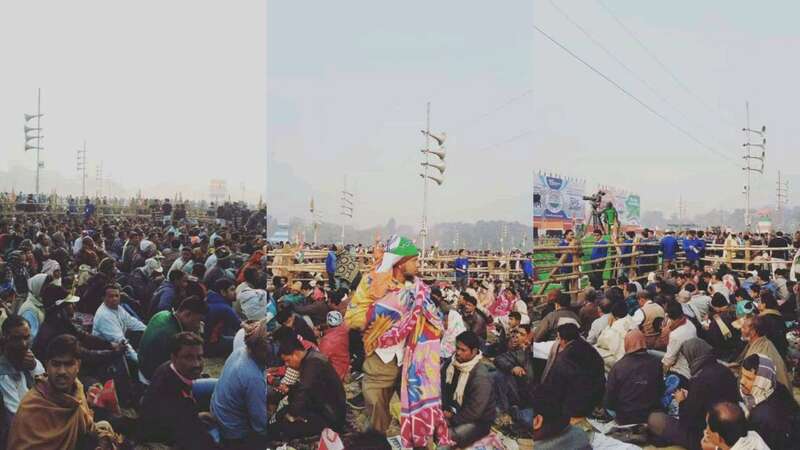 Mamata Banerjee’s massive Opposition rally – with over 10 national leaders – are in town and the roads are likely to be jampacked. Over 40 lakh supporters are expected to attend from various parts. None of the rally troupes will walk over flyovers. The police have warned all denizens that there will be a huge swell, that roads will be jammed and has urged people to use metros. There is addition security at every station and metros. 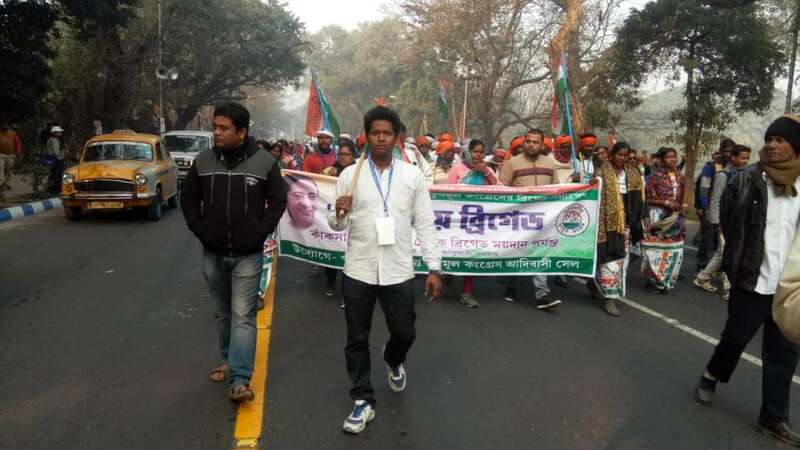 Huge crowds of TMC workers are also expected at Gitanjali Central Park and Stadium who are moving towards Brigade. A lot of them are also at Howrah and Sealdah station. 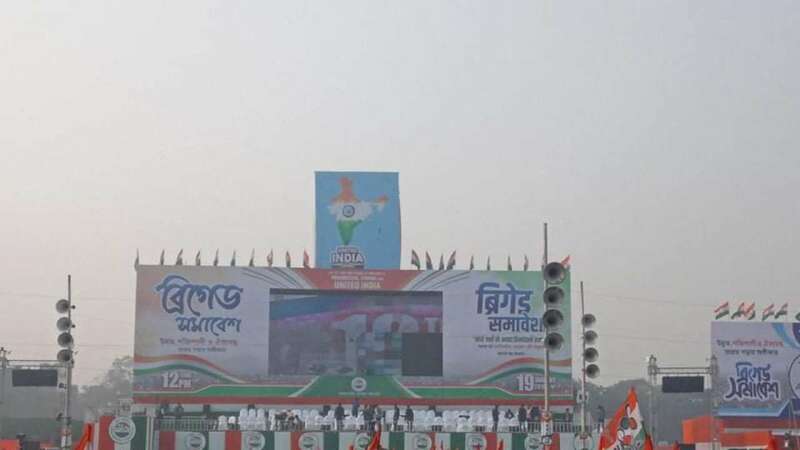 The stage is set for West Bengal Chief Minister and Trinamool Congress supremo Mamata Banerjee’s mega Opposition rally against the Narendra Modi government. FIRST STAGE- The main stage, which will come up in front of the fountain opposite the Victoria Memorial Hall, will accommodate senior leaders including Mamata Banerjee. SECOND AND THIRD STAGE- there will be two stages, one for the MPs and State Government ministers and the other for the district presidents and functionaries. FOURTH AND FIFTH STAGE- those from the cultural world and another on which cultural programmes will be held. 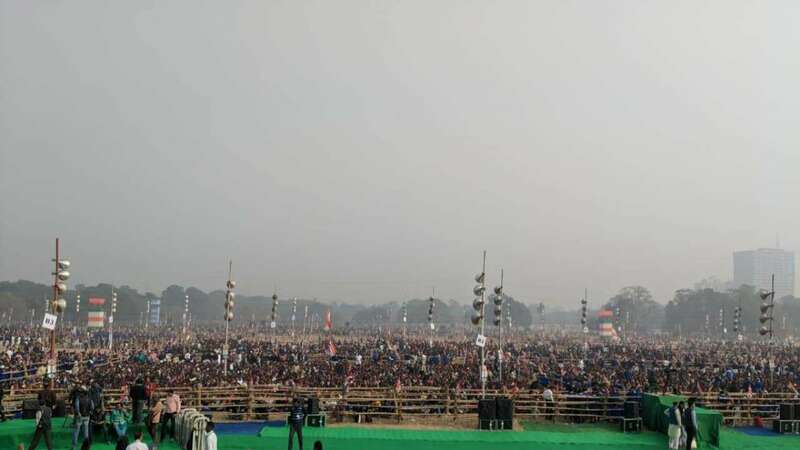 As many as 10,000 police personnel will be deployed and around 400 police pickets have been set up to ensure foolproof security, police said.Policemen in plain clothes, personnel of the Rapid Action Force and Quick Response Team would be deployed at the rally venue. Large scale preparations have been made to ensure that it is a complete success. Besides the huge stages, 20 watch towers have been erected and 1,000 microphones and 30 LED screens put up so that the spectators can see and hear the speeches of the leaders clearly. 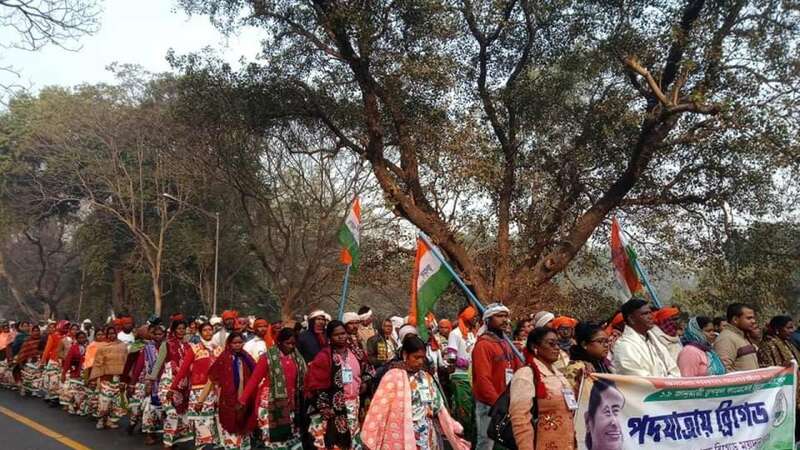 Lakhs of TMC supporters and workers are expected to attend the rally and huge numbers of them from various corners of the state have already started pouring into the city. They have been put up in the outskirts of the city andin some auditoriums and stadiums. Key opposition leaders including SP Chief Akhilesh Yadav, DMK president MK Stalin, former prime minister Deve Gowda, and TDP Chief Chandrababu Naidu met West Bengal Chief Minister Mamata Banerjee ahead of the TMC-led mega rally on Saturday. “Only few hours to go for the historic ‘United India Rally’ at Brigade Parade Grounds. I welcome all national leaders, supporters and lakhs of people to participate in today’s rally to pledge to build a stronger, progressive and united India.” she tweeted. Anticipating heavy rush of commuters in the wake of the TMC-led rally at the Brigade Parade Ground, the Kolkata Metro, which operates under the Ministry of Railways, has beefed up its security arrangements by deploying additional forces apart from the regular contingent. Additional RPF Personnel including officers and staff have been roped in for strategic deployment at all stations to tackle any untoward incident. Commandos will be deployed at Dum Dum, Esplanade and Maidan Stations. Women RPF personnel will also be deployed in adequate numbers at various stations. Mamata has been touring the country since the last one year in an effort to shore up a strong and united opposition front to fight the Lok Sabha elections against the BJP. Large-scale preparations have been made to ensure that the rally turns out to be massive success. Besides the huge stages, 20 watchtowers have been erected and 1,000 microphones and 30 LED screens put up so that the spectators can see the leaders and hear them speak clearly. As many as 10,000 security personnel will be deployed in and around the venue of the rally and around 400 police pickets have been set up to ensure foolproof security, the police said. Lakhs of TMC supporters and workers have started arriving in the city from all over the state. Vehicular movement around the venue has been restricted, the police said.